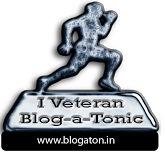 This post has been published by me as a part of the Blog-a-Ton 21; the twenty-first edition of the online marathon of Bloggers; where we decide and we write. To be part of the next edition, visit and start following Blog-a-Ton. This the story where I tell you the events which happened the other day... when..
Was ours a love story .. Nah Yaar .. I am no longer a hopeless romantic .. So what was our story? yeah what was our story? We were introduced by our families .. Yes shocker... Arranged Marriage .. So there we were .. sitting and talking .. and taking shy glances at each other ..
After a small talk I said yes .. she said yes .. Yay .. we were to get married .. I called her .. talked to her .. told her something more about me .. asked more about her .. I was happy . She asked about my past .. I asked about her past .. there no one anywhere .. so far so good..
We talked whatever time we got .. talking about future .. telling each other .. sweet nothings..
She was giving her final exams in some other city and I was planning to give her a surprise by visiting her after her exams.. I used to wish her Good Luck before every exam .. So Far So Good..
Then I got the call ..
"Hi is it Vikrant?" he asked. "Yes .. who is it?" I said . "Its Vishakha's Boy Friend." he said .. and continued.. I next thing I did was to call her and informing about what happened . "Yes, I want to talk to you about that. Do you want me to come there tomorrow?" She said. "No you stay there and complete your exams .. with full concentration and I will meet you there once your exams are over" I said ..
once her exams were over I went over to Delhi to meet her .. The date for marriage was coming closer .. then we got another call this time from Vishakha's mom .. to tell us that .. Vishakha is now saying no to marriage ..
and that was it .. It was her decision to say yes it was her decision to say no ..
then I got a call from her saying that she did not say no and in fact she would only marry me .. my crumbling castle was strong once again..
after that we started talking more regularly .. I was again happy .. but I didn't know that my happiness and my heart were brought together again so that they can be broken again.. nay shattered again. Again a call came .. again the same thing and Vishakha's again saying no to the marriage ..
but this time phone was picked by my mom and she was furious and crying at the same time and me ..
We wanted to make something out of our relation but that wasn't to be .. I wanted to be happy with someone but rather I had my heart broken and stomped up on .. But what are we if not optimistic .. I am sure someone is still out there .. made for me .. if not ..
Nah .. that's not possible .. I praying pray with me .. so that I can find that someone special who is made for me .. come with me and join hands .. and Pray ..
but why would she do that? and what became of her? A nice, yet sad, narrative! I m longer in touch with her Ashish. Apparently she was still not sure and didn't get over him so .. I let her enjoy her while I am living my life that's all ..
maybe she wasn't meant for you.. thats all.. Sad and yet impressive. Good job mate! sad.. I don't have words here.. and if this is true, then i could feel how hurting it would be.. Wanna know what happened the other day? Hmm.. some people are always anxious about taking a wrong decision and in the process they don' take any decisions which proves out to be wrong. what I appreciate is that Vikrant never forced Vishakha .. which is very sensible act.